ERAN EGOZY, Professor of the Practice in Music Technology at MIT, is an entrepreneur, musician and technologist. He is the co-founder and chief scientist of Harmonix Music Systems which developed the video game franchises Guitar Hero and Rock Band, selling over 35 million units worldwide and generating over $1 billion in annual sales. Eran and his business partner Alex Rigopulos were named in Time Magazine’s Time 100, Fortune Magazine’s Top 40 Under 40, and USA Network’s Character Approved awards. Eran is also an accomplished clarinetist. Hailed as “sensitive and energetic” (Boston Musical Intelligencer), he has appeared as soloist with the MIT Symphony Orchestra and as guest artist on the radio show From the Top. 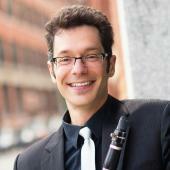 Eran is the clarinetist for Radius Ensemble (named Boston’s Best Classical Ensemble in 2016 by the Improper Bostonian), and has appeared with Boston area ensembles such as Emmanuel Music and A Far Cry. His teachers include Jonathan Cohler, William Wrzesien, and Tom Martin. Eran serves on the Boards of several Boston-area non-profit organizations and mentors and invests in a number of startups in the Boston area. Prior to co-founding Harmonix, Eran earned degrees in Electrical Engineering and Music from MIT, where he conducted research in music technology at the MIT Media Lab. His current research and teaching interests are interactive music systems, music information retrieval, and multimodal musical expression and engagement. His recent projects include *12*, an audience-participation work for chamber music were audience members use their mobile to musically interact with the stage musicians, and Tutti, a massively multiplayer mobile-audience performance piece where the entire audience becomes the orchestra. Eran is currently developing ConcertCue, a program-note streaming mobile app for live classical music concerts. ConcertCue has been featured in concerts of the Boston Symphony Orchestra, and has recently been awarded a grant from the Knight Foundation.